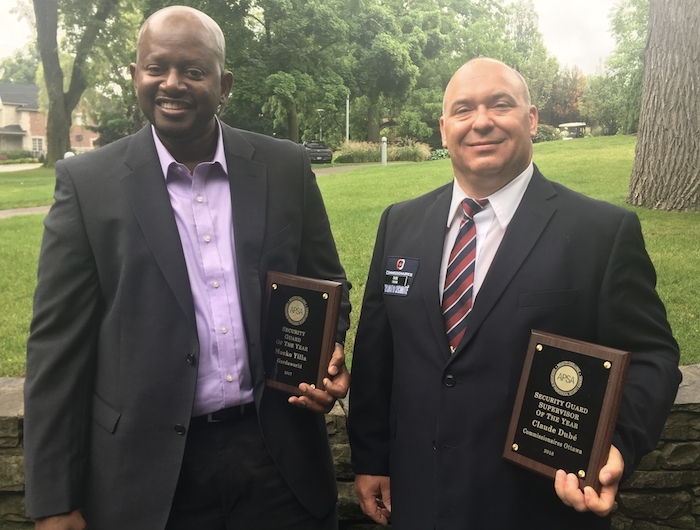 The Association of Professional Security Agencies (APSA) Wednesday announced the winners of its annual Security Guard of the Year and Security Guard Supervisor of the Year awards, recognizing diligence and superior customer service on the job. Supervisor of the year was awarded to Claude Dubé, a supervisor with Commissionaires Ottawa, who works at Rideau Hall, the Governor General’s residence. Dubé, who retired from the Canadian Armed Forces after 16 years of service in 2002, joined Commissionaires at Rideau Hall as a guard. He has since been promoted to shift superior, training officer and most recently section supervisor in 2013. He now oversees approximately 75 personnel and has worked in collaboration with the RCMP to secure VIPs including Prime Minister Justin Trudeau. Kevin Cooney, busness operations manager, Commissionaires Ottawa, who attended the award ceremony with Dubé, spoke highly of his contributions to Commissionaires and the clients he serves. “We were honoured to put a package together recommending Claude for this award,” said Cooney. Accepting the award, Dubé commented, “It’s really humbling, but I would not be able to do this without the support of Commissionaires Ottawa. It’s a great honour.” He also thanked his team and staff at Rideau Hall for their hard work and continued support. The Security Guard of the Year award was presented this year to Mocko Yilla, a GardaWorld frontline employee who works at the Miziwe Biik Aboriginal Employment Centre in Toronto. Yilla works as a lone security guard at the centre and has been embraced as a member of their team. Last year, Yilla was presented with the centre’s employee of the quarter award, a recognition normally reserved for the centre’s own employees. Yilla has an unblemished employment and attendance record and was recognized for his strong customer service skills. The award was presented to Yilla by Allan Gosling, Portfolio Director, Protective Services, GardaWorld. Gosling noted that when a client considers a guard to a member of their own team, it is the “ultimate recognition” of the quality of service they are able to provide. “It’s a great job and a great environment. It’s a really good company to work for. It’s been wonderful and I’m really appreciative of this [award] today. It’s very humbling,” said Yilla. He added that sometimes he might have to diffuse a situation as part of his job, but “it’s all about empathy,” he said.